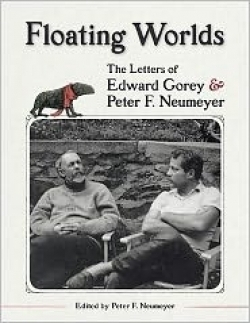 Fans of the prolific author/illustrator Edward Gorey will delight in Floating Worlds: The Letters of Edward Gorey & Peter F. Neumeyer, which chronicles the personal correspondence between the pair as they collaborated on three children’s books. But even those uninitiated to the macabre and fanciful world of Gorey (never seen the Masterpiece Theater introduction on PBS?) will revel in the tome as well—it’s sort of a Griffin & Sabine for the literary set, with flashes of Gorey’s remarkable wit, self-deprecating humor, streaks of melancholia, and most of all—his brilliance—shining throughout. The letters—never before seen—flew between the pair at a fair clip for a year, from September 1968 to October 1969, while Gorey was illustrating three books Neumeyer had written: Donald and the … , Donald Has a Difficulty and Why We Have Day and Night. At the time, Gorey (“Ted” to his friends) was writing and illustrating books while living in Cape Cod and New York City; Neumeyer was a professor, first at Harvard and then at SUNY Stony Brook. The book is filled with pictures of beautifully illustrated envelopes, handwritten postcards, and typewritten notes that cover everything from the books to the men’s shared love of literature, philosophy, and art. But they are more than just creative affairs—readers get to witness the birth of a platonic friendship in these honest, emotional letters tugging at the heart. They will make many a reader long to have such a deep, intellectual, passionate, and creative relationship with someone.